A 30-year-old woman has been arrested in hospital on suspicion of murder after the body of a toddler was found by police. 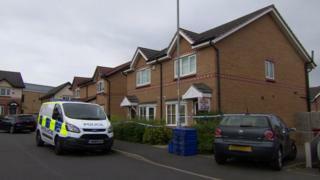 The boy was found dead at a house in Beaford Road, Wythenshawe, Manchester, at about 00:05 BST on Sunday. The woman remains in hospital being treated, police said. Post-mortem tests on the boy are due later. A 31-year-old man arrested earlier on suspicion of murder remains in police custody for questioning. Officers said they were called to the house following a report of a "domestic disturbance". A woman, who was seriously injured, along with a man had both left for hospital before police arrived. When officers went into the house they found the body of the boy, who is yet to be formally identified. It has emerged officers had been to the address on Friday after a similar incident was reported. Image caption Supt John-Paul Ruffle said it was an "absolutely tragic case"
Det Insp Carl Jones, of Greater Manchester Police, said the investigation was "progressing but still in the early stages". Police have cordoned off the property while investigations take place and more officers are expected to be in the area over the coming days. A Volkswagen Polo car, which was parked in the driveway, is also within the cordon. Neighbours said they were woken by the sounds of sirens from police cars and ambulances. The police force has referred itself to the Independent Police Complaints Commission as it had previously been called to the property.